Probably not the easiest thing in the world but not that tough to do either! Living on $20000 a year is possible for those who are single, especially those who are living with their roommates. People have done it several times and you can do it as well. This post will help you learn some really simple and cool ideas that can help you survive a year within $20,000 a year. These tips to save money are not the easiest but definitely, promise good results. So give it a good read and let us know! The following mentioned are few tips for saving money and to how to live on 20000 a year. How to Live on $20000 Per Year? One of the best ways to save money and spend not more than $20,000 a year is by stop wasting money. A great way to get this done is by not wasting cash at restaurants. Most restaurants these days are highly expensive and can cost you a lot of money. You can save the money instead and eat at home. Plus you don’t really have to eat lavish food all the time. They aren’t very good for your health either. Take some time off and cook a little more with your family at home. In that way, you will be saving up a lot of money. There are so many delicious meals one can cook at home without having to waste cash. These are few great money saving tips. We all love going to vacations but please remember it costs a lot of money. If you can, at least temporarily, you should stop going on vacations for some time. If you want, you could go somewhere for the weekend that too some place that is not too far. There should not be more than two vacations in a year if you really want survive on $20,000 in a year. It will definitely cut down your vacations and help you save up for the future. A third thing you should do is keep working hard and focus on the money you are earning. Now that doesn’t mean you should become a money oriented person and spend nothing at all. I just mean that you should focus only on yourself and keep making money. Don’t miss out on the chance to earn an incentive. That will keep you more busy and you won’t have to spend time on other things like shopping and the movies. People who work incredibly hard don’t have enough time for every single bit of entertainment. Enjoy yourself but keep work first! You should also remember to focus on the big picture if you want to survive within $20,000 a year. You have to understand why you are really doing it and what you need to do in order to accomplish that. Make sure you have a good idea of what really matters to you at this point. It doesn’t matter whether you have to spend more time with family or spend time with the kids at home. Just have the big picture in mind and make good chances financially. This is something very important! If you have some debts that haven’t been paid yet, make sure to finish it right away. Also don’t make the mistake of borrowing the same money again. Debts tend of pile up over a period of time as a result of which you might have to pay more interest. You can save yourself from the situation by getting rid of it once and for all. People who get rid of the debts fast are always able to save more money in the long run. So if there are any left, get rid of it as soon as possible. Back in the year of 2011, I had set huge saving goals for myself. I had finished paying all of my debut and was now focusing on coming up with an emergency fund. By taking a quick look at the financial picture, I understood that with my cash surplus every single month, I could even save cash up to $10,000 as emergency fund. It was quite a long process but was very much possible. When we speak of bad habits, we are obviously talking about alcohol and smoking. Alcohol takes up a lot of money and so does cigarettes. All throughout the year, there are so many times people drink and smoke and spend time on drugs and that really wastes a ton of money. If you can really get rid of this, you will definitely be able to survive on 20 k dollars without having to mooch anyone. Sounds like a good idea doesn’t it? If you have a problem in order to survive without them, try nicotine gums or other healthy habits to replace them. Ask your doctor about some natural methods. That will surely help. How to Take Care of Basic Needs and Necessities of Life? This section will help you take care of basic human needs and basic necessities such as food, clothes, education, entertainment, furnishings etc! 1. How To Save Money Despite Having Fun? Instead of eating out at restaurants on a regular basis, stay back at home. Eating a salad at a decent restaurant will cost you around $10 but if you make some at home, it will cost you much less. In fact, you will have a salad party at home at a much smaller cost. A very simple snack most people do is having popcorn sprinkled with parmesan with nice healthy homemade drinks and some home made brownies. You may also enjoy yourself playing basketball or go on a long hike if you want more entertainment. Instead of spending money buying CDs, read some books at the library. Easy! 2. What should you do about food? The best and most organic foods in the world are never expensive. Fresh vegetables, fruits, tuna fish, whole wheat bread, peanut butter, milk and other foods are not expensive at all. Plus there are wines that taste good and don’t cost more than 5 dollars. You can try shaw red and white wine that are only 3 dollars per bottle. You don’t even need to worry about alcohol anymore after this. By following this savings tips you can save money on food. 3. How to take care of matters related to housing? Matters related to housing are a bit risky and should be given importance. This is not just the biggest expense but also something you must always keep in mind. And since we know how expensive things can get, we have some really cool and interesting ideas that could help. First of all, you can visit your neighborhood and post a few flyers saying that you are looking for an attic or basement you want to live in and that you’d be paying a thousand dollars. Also say that in exchange you would do something for them like take care of their babies or clean their garden etc. If you are earning around $20,000 a year, you and your family will have either qualify under the category of free or low cost health insurance plans and schemes. Obama Care is also there for guys like you. So don’t worry about that at all! There are times when I found such expensive designer outfits at these consignment stores on the streets of America for very little money… for pennies rather. These clothes are basically worn by the rich masses and then after it has been worn a couple times, they give it away to other thrift stores like Goodwill and Salvation Army, especially those who are found in the high income areas and are selling clothes that are good in quality in pennies rather than dollars. So now you know where to shop from! If your daughter gets into a good college, it is best to send her to community college in the first two years. Community colleges are not in the least expensive but also have good teaching quality. That means you don’t have to worry about teaching your kids or sending them to do research work at the library. Everything can be done right there. Plus it doesn’t have more than $12000 per year. Your child will be in a good environment and also come back home after attending classes instead of going miles away. Plus it is quite easy to transfer to send them to a college that is much more prestigious after the first few years instead of sending them right after high school. The society we live in is mobile therefore moving furniture all the time can be a little expensive. So in case you are living in a college that is residential, you will surely find people who are selling furniture for music. You can check websites like craiglist.org along with some local print and some online publications alongside for moving some sales. You may also check out some flea markets along with some thrift stores. Things here are so nice. From getting framed paintings to beautiful sofas, things can be done within dollars. Other important tips that should help you! The following mentioned are the few additional tips on saving money. It is very hard to say no when your friends are calling you to go out and have fun, especially if they have been calling you often. But we have learned that you can save up quite a bit of money if you just learn how to say no. You may also suggest an alternative that is free and low at cost. In that way, you will be saving a whole lot of money. Sometimes expensive pals could cost you an arm or even a leg. You have to know how to say no to them if you want to take a good control of what you are spending. Having a budget is important, especially if you are going to live within $20,000 a year. A budget is usually something where you will keep a track on how much money you will spend every month. This is quite different and advanced but can surely help you in the long run. It There are some apps that can actually help you with this. We can suggest you Mint or maybe Quicken. They are free, easy to use and promise to make work much easy. You will also be able to control all your expenses such as entertainment, shopping or even groceries. You can start this for sure as it worked pretty well for me and handled all my expenses like anything. There are several other apps available online. Try them all! We live in a materialistic society which makes it very difficult to live within merely 20k dollars a year. If you have been earning 15 dollars a day, then probably it makes things worse. But it certainly does not mean that you can’t. To be honest, we waste a lot more money a year than we can possibly imagine. 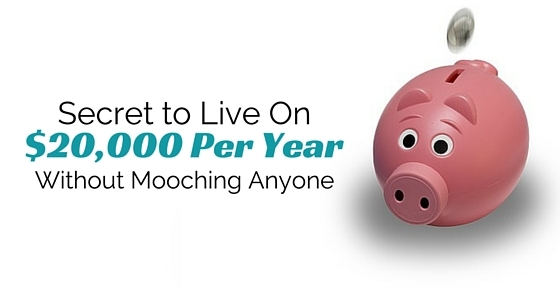 If you follow these quick tips and ideas, you will definitely be able to save a whole lot of money and survive the whole year without mooching anybody! Plus if you have liked the post and have some suggestions to give, feel free to drop a comment below. We would love to hear all your queries. On that note, good luck!